The remaining three finalists in “The Biggest Loser” season 15 finale were from three completely different worlds and backgrounds – Rachel Frederickson, David Brown, and Bobby Saleem who trained all season long under the heavy thumbs of trainers Bob Harper, Jillian Michaels, and Dolvett Quince. Pictured (l-r): David Brown, Bobby Saleem, Alison Sweeney. When Bobby came out on stage, trainer Bob Harper was so emotional, he broke-down and cried as he hugged Bobby. Host Alison Sweeney, said, “You are the second chances story of the season.” Bobby reminisced, “When I first got on the ranch I was a broken person. I was so ashamed. I couldn’t even look int the mirror.” He said now, he is such a confident person. When Sweeney asked him if he was looking forward to seed the other finalists contenders Rachel and David, He said that no he couldn’t wait and looked forward to seeing Rachel the most. She’s 23 years old and was once a world class swimmer. Rachel said, “I used to be in the best shape of my life. Now I”m too embarrassed to go home…I’m living my second chance.” During her consultation with the doctor on the show, after losing so many pounds, he told her she was within five pounds of professional athlete weight. Rachel said, “I finally came out of hiding and shared my story. It’s that moment where I say I’m gong to embrace me…move forward and take control of anything I want. It’s okay to follow your own path.” She said her mom is her “rock” as she teared-up and got emotional. Read about Jillian Michaels healthy living advice EXCLUSIVE here! 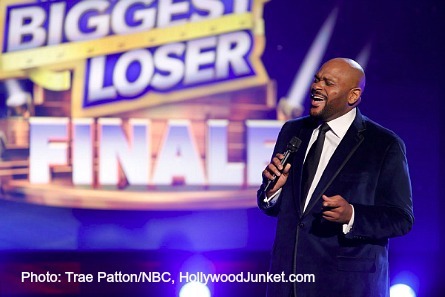 Reality star Ruben Studdard, winner of “American Idol” season two, was a contestant on “The Biggest Loser” this season. He returned tonight not only to weigh-in for the at home challenge, but also to perform his latest single. Studdard weighed-in at 343 pounds tonight during the finale show. Pictured: Ruben Studdard performs on The Biggest Loser finale. The winner of the at-home challenge of $100,000 for the highest percentage of body weight lost went to Tumi Oguntala, age 40, a brand strategist from Clifton Park who lost 175 pounds with a final weight of 144 down from her starting weight of 319 pounds. Her competitor, Jay lost 114 pounds from his starting weight of 297 pounds, making his total weight loss 183 pounds. 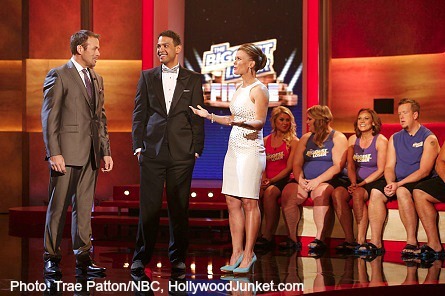 Before revealing the winner of “The Biggest Loser”, the coaches talked to some winners in the audience who have succeeded in their own personal weight challenges in “CHALLENGE AMERICA”. Jillian Michaels introduced Sheen who lost 159 lbs. Sheena sad she has completely dedicated her life to fitness and because of Jillian, she was inspired to become a fitness trainer herself. Michaels loved to hear that and gave her a hug. Bob Harper talked to Sal who is “not a big guy.” He lost 125 pounds. Sal said he referred to himself as a “big guy”, But changed his perspective when Harper asked him what if he ever realized how people must feel when they see him (an over-weight fire fighter) going into a burning building to save their child. Dolvett Quince talked to Jane who lost 153 pounds. She said she was diagnosed with breast cancer. After Jane fought and won that battle, she said she decided to battle the bulge and joined the gym. Jillian Michaels on THE BIGGEST LOSER contestants’ calorie intake here! Rachel started the show at 260 pounds. She would have needed to lose more than 136 pounds(155 pounds is what she lost) in order to take the lead. Her current weight was 105 pounds. She led with 59.26 percent of body fat lost. Pictured: Rachel Frederickson in her final weigh-in. Competing for the grand prize of $250,000, The final two were Rachel and David. David’s starting weight was 409 pounds. He said he thanked God for this moment and thanked his family for supporting him for no matter what size he was. For the win, David needed to have lost more than 243 pounds. He stood on the scale at 187 pounds, losing 222 pounds. Which meant Rachel is the newest “The Biggest Loser” champion!